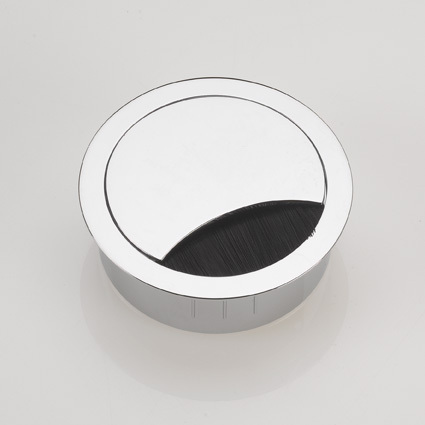 Most Ports are available in a choice of finishes incluing Bright or Brushed Chrome, Matt Stainless, Aluminium, Black Nickel and High Gloss White and all have a brush lining which closes neatly round the cables meaning you don't get any unsightly holes in the worktop. Thanks for your feedback and just looking at this one, I see you've gone for a premium metal grommets, sourced from one of the european factories we use. Incidentally, we do offer less expensive metal grommets that are imported from the far east but they tend to come in straight forward metallic finishes, such as Bright & Matt Chrome, Stainless and Satin Nickel, whereas if you want the Metal Grommet in a Black or White finish, the Eclipse is really the only option. We do offer volume based discounts which you've obviously taken advantage of I can see, but if the order is likely to repeat then please speak to us, as you may well qualify for wholesale trade rates, which will open up a new tier of discounts for you! Good product. robust mechanism and brush fitting.